Some coastal areas are dominated by erosion, an example being the Pacific coast of Canada and the United States, while others are dominated by deposition, examples being the Atlantic and Caribbean coasts of the United States. But on almost all coasts, both deposition and erosion are happening to varying degrees most of the time, although in different places. This is clearly evident in the Tofino area of Vancouver Island (Figure 17.1), where erosion is the predominant process on the rocky headlands, while depositional processes predominate within the bays. On deposition-dominant coasts, the coastal sediments are still being eroded from some areas and deposited in others. The main factor in determining if a coast is dominated by erosion or deposition is its history of tectonic activity. A coast like that of British Columbia is tectonically active, and compression and uplift have been going on for tens of millions of years. This coast has also been uplifted during the past 15,000 years by isostatic rebound due to deglaciation. The coasts of the United States along the Atlantic and the Gulf of Mexico have not seen significant tectonic activity in a few hundred million years, and except in the northeast, have not experienced post-glacial uplift. These areas have relatively little topographic relief, and there is now minimal erosion of coastal bedrock. On coasts that are dominated by depositional processes, most of the sediment being deposited typically comes from large rivers. An obvious example is where the Mississippi River flows into the Gulf of Mexico at New Orleans; another is the Fraser River at Vancouver. 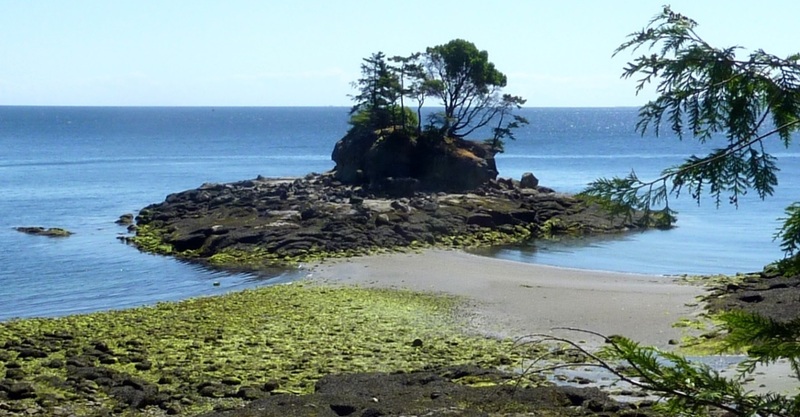 There are no large rivers bringing sandy sediments to the west coast of Vancouver Island, but there are still long and wide sandy beaches there. In this area, most of the sand comes from glaciofluvial sand deposits situated along the shore behind the beach, and some comes from the erosion of the rocks on the headlands. The components of a typical beach are shown in Figure 17.16. On a sandy marine beach, the beach face is the area between the low and high tide levels. A berm is a flatter region beyond the reach of high tides; this area stays dry except during large storms. Most beaches go through a seasonal cycle because conditions change from summer to winter. In summer, sea conditions are relatively calm with long-wavelength, low-amplitude waves generated by distant winds. Winter conditions are rougher, with shorter-wavelength, higher-amplitude waves caused by strong local winds. 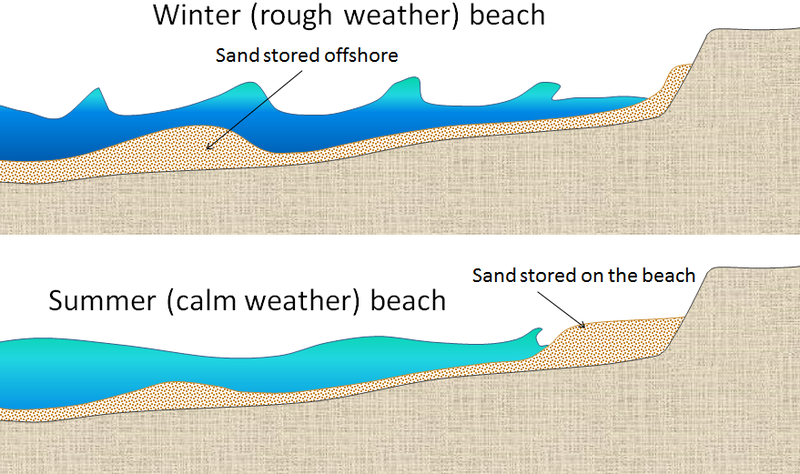 As shown in Figure 17.17, the heavy seas of winter gradually erode sand from beaches, moving it to an underwater sandbar offshore from the beach. The gentler waves of summer gradually push this sand back toward the shore, creating a wider and flatter beach. The evolution of sandy depositional features on sea coasts is primarily influenced by waves and currents, especially longshore currents. As sediment is transported along a shore, either it is deposited on beaches, or it creates other depositional features. A spit, for example is an elongated sandy deposit that extends out into open water in the direction of a longshore current. A good example is Goose Spit at Comox on Vancouver Island (Figure 17.18). 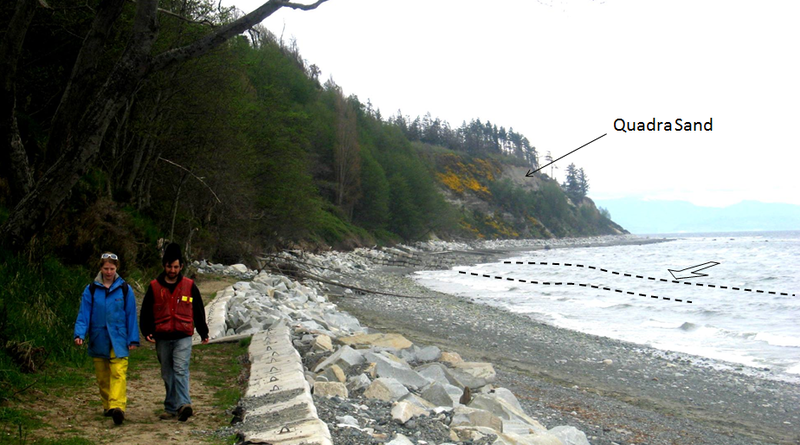 At this location, the longshore current typically flows toward the southwest, and the sand eroded from a 60 m high cliff of Pleistocene glaciofluvial Quadra Sand is pushed in that direction and then out into Comox Harbour. The Quadra Sand at Comox is visible in Figure 17.19. There are numerous homes built at the top of the cliff, and the property owners have gone to considerable expense to reinforce the base of the cliff with large angular rocks (rip-rap) and concrete barriers so as to limit further erosion of their properties. One result of this will be to starve Goose Spit of sediments and eventually contribute to its erosion. Of course the rocks and concrete barriers are only temporary; they will be eroded by strong winter storms over the next few decades and the Quadra Sand will once again contribute to the maintenance of Goose Spit. A spit that extends across a bay to the extent of closing, or almost closing it off, is known as a baymouth bar. 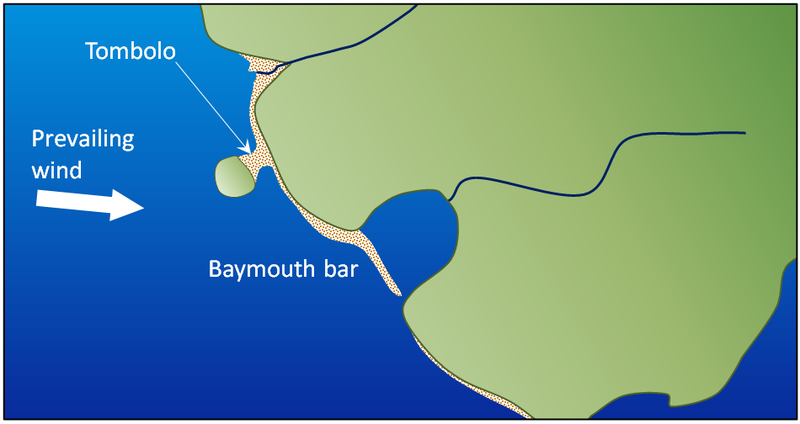 Most bays have streams flowing into them, and since this water has to get out, it is rare that a baymouth bar will completely close the entrance to a bay. 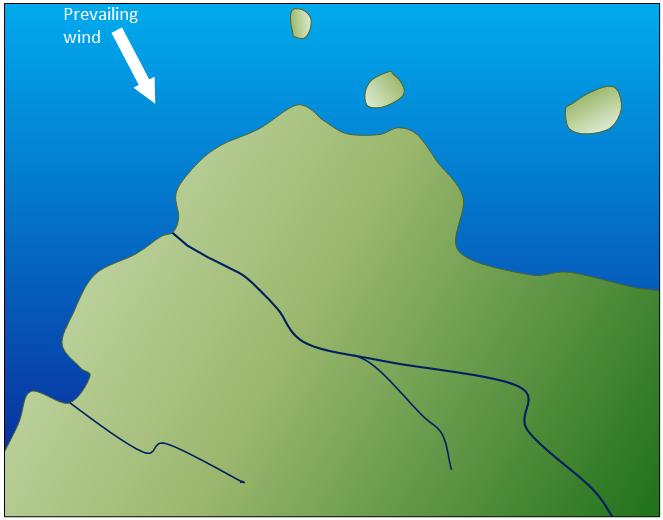 In areas where there is sufficient sediment being transported, and there are near-shore islands, a tombolo may form (Figure 17.20). Tombolos are common around the southern part of the coast of British Columbia, where islands are abundant, and they typically form where there is a wave shadow behind a nearshore island (Figure 17.21). This becomes an area with reduced energy, and so the longshore current slows and sediments accumulate. Eventually enough sediments accumulate to connect the island to the mainland with a tombolo. There is a good example of a tombolo in Figure 17.1, and another in Figure 17.22. In areas where coastal sediments are abundant and coastal relief is low (because there has been little or no recent coastal uplift), it is common for barrier islands to form (Figure 17.23). 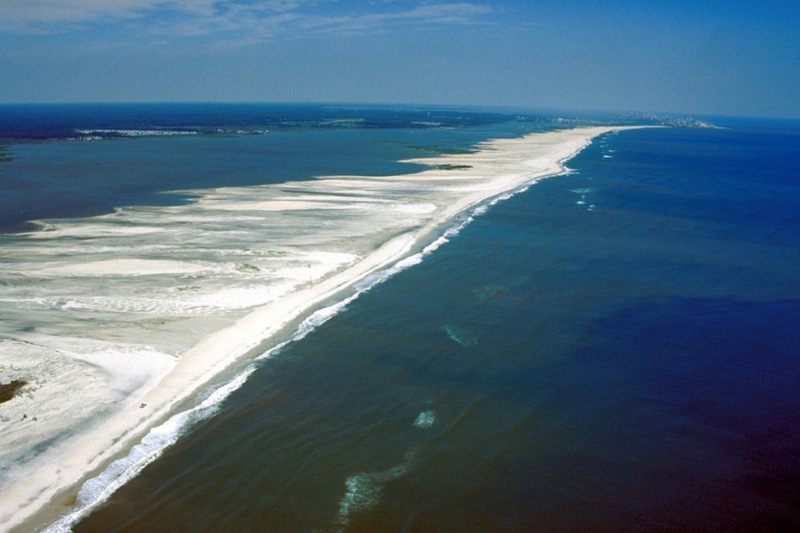 Barrier islands are elongated islands composed of sand that form a few kilometres away from the mainland. They are common along the U.S. Gulf Coast from Texas to Florida, and along the U.S. Atlantic Coast from Florida to Massachusetts. North of Boston, the coast becomes rocky, partly because that area has been affected by post-glacial crustal rebound. What conditions might lead to the formation of barrier islands in this area? Some coasts in tropical regions (between 30° S and 30° N) are characterized by carbonate reefs. Reefs form in relatively shallow marine water within a few hundred to a few thousand metres of shore in areas where there is little or no input of clastic sediments from streams, and marine organisms such as corals, algae, and shelled organisms can thrive. The associated biological processes are enhanced where upwelling currents bring chemical nutrients from deeper water (but not so deep that the water is cooler than about 25°C) (Figure 17.24). Sediments that form in the back reef (shore side) and fore reef (ocean side) are typically dominated by carbonate fragments eroded from the reef and from organisms that thrive in the back-reef area that is protected from wave energy by the reef. 17.3 Landforms of Coastal Deposition by Steven Earle is licensed under a Creative Commons Attribution 4.0 International License, except where otherwise noted.